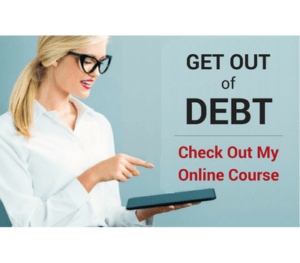 When you’re starting to get out of debt, one of the first steps I recommend in my online course is to build a $1,000 emergency fund. When you’re getting out of debt, an emergency fund is absolutely necessary because emergencies have a bad habit of happening at the worst possible time. If you’re not prepared for the inevitable bump in the road, an emergency expense will derail your get out of debt plan quicker than you can say “broken water heater”. Having emergency funds in reserve keeps you from being tempted to use credit cards, payday loans, and cash advances to deal with the curveballs of life. It keeps you protected and on track to get out of debt while helping you develop the new habits you need to get out of debt for good. Below I’ll show you why an emergency fund is necessary, and how you can save $1,000 to fund yours, even if you don’t have a large income. Why Do You Need $1,000 for an Emergency Fund? $1,000 is a great number for a beginning emergency fund. Most typical emergency situations can be taken care of with that amount of cash. A broken water heater, average car repair, or trip to the doctor can (most of the time) be easily taken care of when you have $1,000 in the bank to deal with it. However, if you have a high income you might need even more (say $1,500-$2,000). Having an emergency reserve allows you to deal with your problem quickly and move on. When you don’t have that money available it’s easy to panic. Panicking forces you into stupid financial decisions that stay with you for months or even years. Being able to calmly deal with an emergency without emotional baggage does wonders for your stress level! One of the main things you have to do when getting out of debt is to form new habits. You can’t form new habits if you don’t set yourself up for success. An emergency stash helps you establish better money habits because it eliminates the need to borrow money from family, take out a payday loan, or increase your credit card balance. It allows you to start thinking and acting differently when the inevitable bump in the road comes along. Nothing can derail getting out of debt like an unexpected expense. Keeping money in reserve for those unexpected things you know are going to happen allows you to stay focused on getting out of debt instead of piling on more. Think of it as get out of debt insurance! 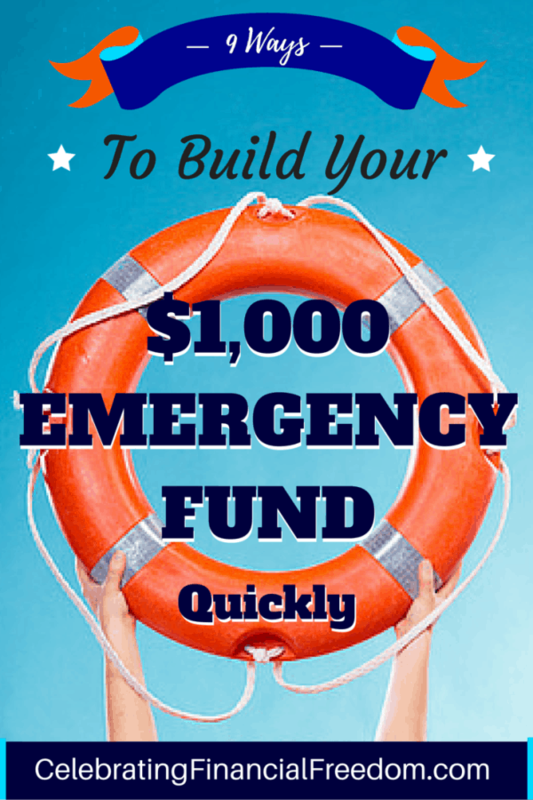 9 Ways to Build Your $1,000 Emergency Fund Quickly- It's Easier Than You Think! Even if you don’t have a high income, creating a starter emergency fund doesn’t have to seem like an impossible task. In fact, you can come up with the money quicker and easier than you think if you just use a little creativity. Below are some great ways to help get your emergency fund together as quickly as possible. The average tax refund is over $3,000. Starting an emergency fund during tax time is perfect timing because you can build your fund very quickly and pay off some of your debt too! Using your tax refund is probably the best and easiest way to start meeting your financial goals. Most everybody has too much stuff. Getting rid of all the things you don’t need and never use can add up to a large pile of quick cash! Gather all your things together that you are ready to get rid of and sell them on eBay, Craigslist, or have a yard sale. You’ll be amazed at how quickly the bucks add up! One very specific thing you can sell is your old gold jewelry. Maybe you have some old broken chains, single earrings, and other broken or outdated jewelry that you don’t know what do to with. You can sell that jewelry for the value of the gold (or other precious metals) and get a nice chunk of money. However, you can’t trust every strip mall gold buyer to give you top dollar for your gold. Some will even give you less than 50% of what it’s actually worth! If you have to, get a part time job. Yes, I know that’s no fun. I also know that being in debt stinks and a part time job will only be temporary. You might even want to keep that part time job after you get your emergency fund in place to pay off your debt that much quicker. You’d be surprised how working just a few hours a week can accelerate your get out of debt plan! 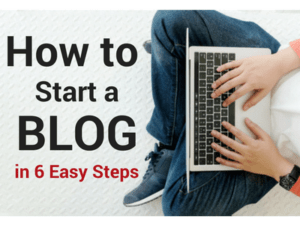 Doing a written budget every month cures a ton of financial ills. Budgeting not only helps you get control of your cash flow, it also helps you stop wasting money. 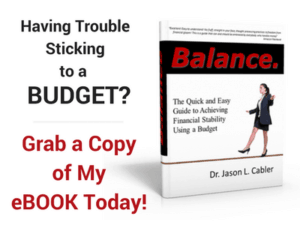 Trust me, if you’re not doing a budget you’re wasting money whether you know it or not. Once you start you will find out where the waste is, then you can start directing that extra money you no longer waste into emergency savings! This is where a lot of people get into trouble. Eating out costs 4x more than eating a home cooked meal. You can easily save hundreds of dollars by staying out of restaurants for a month or two. Put that money in the bank instead. Of course you won’t have to stop eating out forever, but it’s well worth the sacrifice to have the peace of mind that comes with having an emergency stash of cash when you need it. If you have any whole life insurance policies, you can cash those out for a quick way to create your emergency fund. Whole life policies are not a good investment and are terribly overpriced. Cash them out and take out a term life policy instead. You’ll save around 90% on your premiums and have a pocket full of emergency cash to boot! Make a commitment to limit spending to only the essentials for 30 days. That means not going out to eat, no Starbucks, no spending on entertainment, etc. Cut everything back to the basics and put all the money you save into your emergency account. You’ll be surprised how much you can save in just 30 days. You’ll also be surprised how easy it is to do without some of those extras you thought were so essential! You can save a lot of money by simply making a few phone calls. Contact your cable company and negotiate a lower bill. Call your credit card company and get a lower interest rate. Call your insurance company and find a way to get a lower rate on your car insurance. Any other bills that you can renegotiate or eliminate can save you money to put in your emergency stash. Building an emergency fund is one of the essential things you have to do if you want to get out of debt for good. If you start working your get out of debt plan without putting an emergency stash in place first, more often than not you will end up failing at getting out of debt. It happens because financial emergencies are inevitable. When you’re not prepared to handle emergencies immediately, your get out of debt plan gets derailed and becomes chaotic. At that point you’re more focused on dealing with an emergency that puts you in a financial bind. Getting out of debt has to take a back seat for weeks or months. Discouragement and lack of focus set in. Before you know it you’re back into old habits, deeper in debt, wondering what the heck happened. A Full Emergency Fund = Financial Success! So, having a $1,000 beginning emergency fund is an essential part of getting out of debt. It helps ensure you actually succeed with your ultimate plan of being debt free. Use the tips above and do everything you can to make it happen. Then start working your get out of debt plan and you WILL be successful in the end! Question: Do you have any more tips for getting cash for an emergency fund? Leave a comment on our Facebook page or below and tell me your favorite ideas. Dr. Cabler I have learned that paying my homeowner and Auto insurances for the year save me money in the long run. I actually use my tax return money to do this each year and it gives me peace of mind throughout the yr knowing it’s taken care of and I’ve saved money at the same time. Great tips…gonna have me a yard sale soon and checking to make sure my life insurance is term which I believe it is but want to double check. Thank you for the awesome post. Thanks Laura! Anything you can do to bring yourself financial peace of mind is great! Not having to worry about paying your insurances on time every single month is great for eliminating “bill stress” from your life. Hope your yard sale is successful!